Marriage isn’t all about romance or heart connections. (Don’t we wish!) The everyday stuff of life includes housework, yard work, and more. Much more. I’ll never forget the look on my new husband’s face as he took a bite of the stew I’d had simmering in the crockpot all day. We’d only been married a few weeks, and I’d decided to embrace the role of domestic goddess. I knew I was no June Cleaver, or even Alice from the Brady Bunch. Still, wanting to do this marriage thing right, I’d purchased a cookbook and set to work. “A grape?” I scooted my spoon around in the bowl, my smile fading. Sure enough, the raisins (which the recipe had called for, by the way) had swelled into large, fat grapes. Not only that, the grapes had given the whole pot a “fruity” flavor. Even after we picked them out we deemed the meal inedible. My new husband was kind as I blubbered on about having never made stew before. In fact, as he soon found out, I’d never made much of anything. Growing up in the recession of the 80s, both my parents worked. Dinner often consisted of TV dinners or Banquet fried chicken from a box. When my mom did cook from scratch, I was usually at cheerleading practice or studying for a test. Besides, it was easier for Mom to just do it herself than to show me how. After that “raisin stew” dinner (and a dozen similar ones to follow) my enthusiasm waned. How in the world could I get the hang of this domestic thing? Where was Caroline Ingalls when I need her? Ma, help! A hundred years ago women lived among a community where young girls were trained on the finer ways of caring for a home. For the most part, when a new bride stepped into her role as wife she was prepared for her domestic roles—namely sewing, cleaning and, yes, cooking. I entered my marriage with good intentions and very little skill. Still, my efforts weren’t hindered. I was a smart girl. I was on the Dean’s List in college for heaven’s sake. How hard could it be? Did you enter into #marriage with false expectations? Don’t worry; so did @TriciaGoyer! I soon learned to cook and clean. But . . . that didn’t mean I liked it. Remember those expectations I talked about in the first chapter? I wanted John to do MORE around the house . . . anything would help. I tried complaining. I tried nagging. I was a wonderful martyr. Then I decided to pray about it. Amazingly, instead of zapping my husband, God took me back to my unfulfilled expectations. In His gentle way, God asked me to look at my heart. He also reminded me of John 13:3-5 and 14-16 where Jesus wrapped a towel around his waist and washed His disciple’s feet. Jesus knew that the Father had put all things under his power, and that he had come from God and was returning to God; so he got up from the meal, took off his outer clothing, and wrapped a towel around his waist. After that, he poured water into a basin and began to wash his disciples’ feet, drying them with the towel that was wrapped around him . . .
Jesus didn’t serve because he was inferior. He served out of power. Out of love. Really? Could God’s divine designs be found in the ordinary stuff of life too? There are two ways we can approach the dirty laundry—with resentment and competition (I do more than he/she does . . .) or with a heart of service and love, as Jesus showed us. The latter is the better choice, of course. 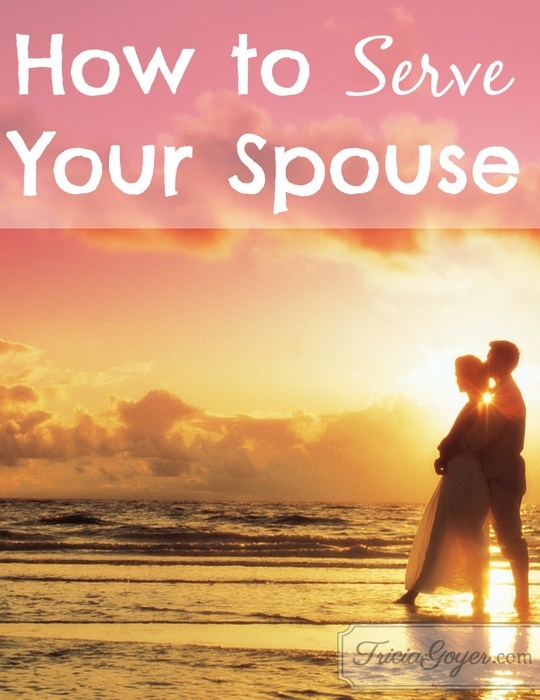 What area is it difficult for you to serve your spouse? Instead of complaining, take a little time to pray. Read through John 13:3-5 and 14-16. Make a list of ways YOU can serve your spouse. Thank you for my spouse and for our marriage. I know I take things for granted and have wrong expectations; help those to change and help me to take on a servant’s heart. Thank you Tricia, so needed this today. Marks on his way home later on. God answered my prayers and in a fast way too. So my need to serve my spouse is hard now, because I do not understand. Laura, that IS hard! I can’t imagine, but I’ve been praying for you! Whew – not always fun, but definitely a needed reminder. I’m just glad I’m not alone in the struggle to find my balance of doing what I know to do and actually doing it. I recognize that the balance begins with the right heart. Oh God, You are Good! I have been praying for ways to help me serve my husband lately and up popped this post on Pinterest. How convenient hehe. I am very much a homemaker: I cook, I sew, I knit, I clean, I look after our children and I do not feel I serve my husband how I should. I need to do it out of love. I want to fill his stomach with nutrition and his soul with love, I want him to know I appreciate him working thirteen hour days to support his family and I want him to know that even with the seemingly neverending list of things to do daily, he is still my favourite thought throughout the day. I serve God in all I do, and I am getting better at serving my husband in all I do for him. We will be celebrating our first anniversary this February and I would like my focus for our second year of marriage to be serving him with love and gratitude. God reveals Himself in the very best of ways, convenient only to our own personal situations. Bless. I am glad to have found your blog. This is a second marriage for both me & my husband. After a tumultuous 5 years together, we are starting over, so to speak. We both need to change old habits. Serving my husband is difficult for me just because it’s something I’m not really used to doing. Ironically my husband has never “served” a woman. He’s use to using them. But this lazt year, and the last few months in particular he has really impressed me in al the little ways he tries to show me that he’s working on becoming a better husband. So I feel it only fair that I do my best to become a better wife.